For children over the age of 3 months, a fever is a temperature of 101 degrees or higher. Oral or rectal temperature readings are the best and the "gold standard" and used in research. For practical reasons, we often will take axillary (under arm) temperatures. Many people will add to axillary temperatures to compensate for it's inaccuracies. 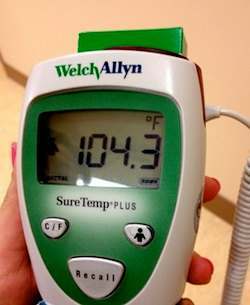 I prefer my patients to report the number and how they took the temperature. The general rule of thermometers: the fancier the thermometer the less accurate. We do not own an ear, forehead or temporal thermometers.